Located on the far west end of the city, you'll find in the small alley alongside a pile of boxes Redds shop. Redd is the name of the fox who runs it, and who sells the items inside. You'll notice you can't get in right away, that's because to get into Redds, you'll need the invitation . The invitation is the only way to get in, you can get it in two ways. You'll need to speak with your villagers in town. If one of them mentions it, say that you'd like the invitation; the next day, you'll have it in the mail from that villager, which you can use to get in. It must be in your letters or else Redd wont see it. If you have friends registered in your game, they can send you an invite over WiiConnect24. Keep the letter on your character and Redd will let you in. 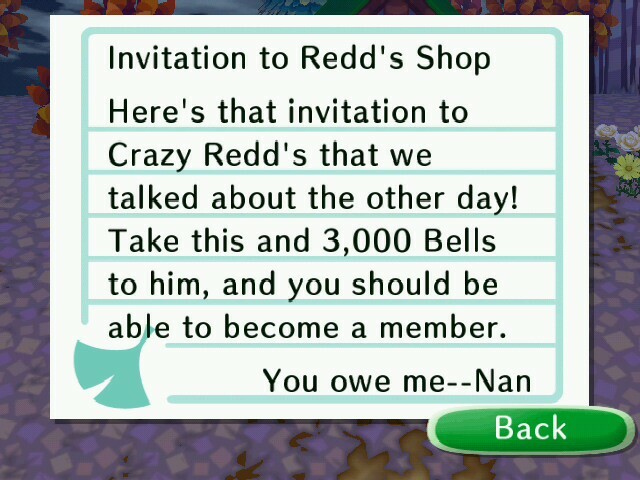 Once in, you'll need to pay 3,000 bells as a members fee, otherwise, you won't be able to buy anything. What's special about Redd's shop (Other than the abnormally high prices) is that sometimes, he'll carry exclusive items, only obtainable from him. The list below is all of his exclusives, if you happen to see any of these next time you're there, you'll know its a good investment. Redd is known for his paintings, and sells almost all there is in the game. All paintings cost 3,960 from Redd, remember, there's a chance a painting can be forged, the only way to check is to donate it to Blathers!